Will Donald Trump’s presidency be a moment of truth for Serbia-Kosovo relations, or is the Balkans issue off the radar for the new administration? If not now, then when can things be set right? Serbian President Tomislav Nikolic must have been asking himself this question when, in a recent interview, he stunned the West by saying that Serbs and Kosovo Albanians were “on the verge of clashes,” and that hopefully under Trump things will not be the same. What else could Nikolic say when “volunteers” from Kosovo’s Albanian majority were mining the railroad that used to connect Kosovo with Serbia, which still considers Kosovo to be part of Serbia. 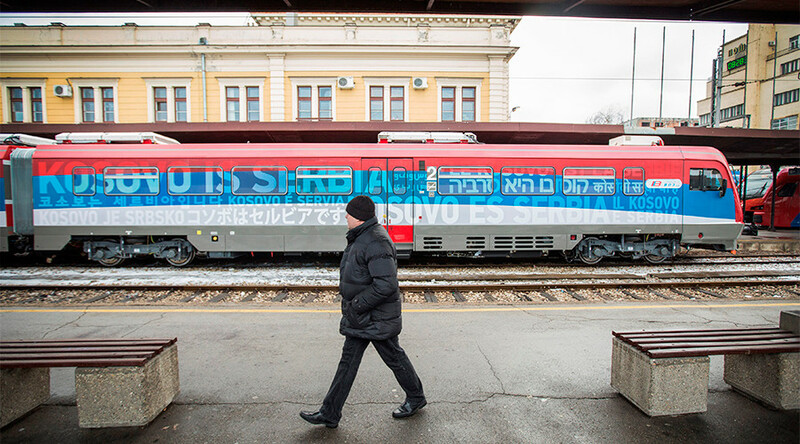 The statement comes after, for the first time in 18 years, a train from Belgrade attempted the trip from Serbia’s capital, Belgrade to Kosovo. 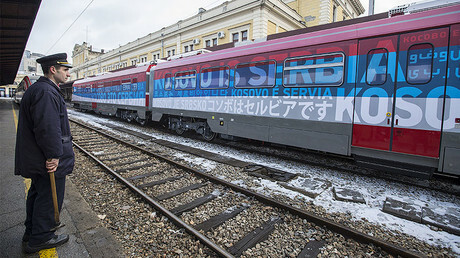 The train was painted in Serbia’s national colors and the slogan “Kosovo is Serbia” – the Serbian government’s official position on the matter. Russian Foreign Minister Sergey Lavrov warned of “tensions” in the Balkans, urging the EU to de-escalate the situation. The EU – troublemaker to peacemaker? One can only wonder at the patience of Lavrov, who is well aware that the EU and some of its member countries have acted as a destabilizing force in the region for many years – at least since 1991, when the violent break-up of Yugoslavia started. Some of the moves by “civilized Europeans” (such as the hasty recognition of Croatian and Bosnian independence by Germany in the early 1990s) are universally recognized as leading to the series of bloody conflicts in the 1990s. Some moves can be seen as harmful by any unbiased observer – such as the EU’s financial, diplomatic, and military support for Kosovo’s secession from Serbia. Or the EU’s pressure on the region to estrange itself from Russia – beginning with support for Montenegro’s membership in NATO and ending with the recent call on the Serbian government to shut down a Russian humanitarian center in the Serbian city of Nis. Even the rhetoric of the two sides in the renewed Kosovo conflict reveals who is belligerent and who is peace-loving. “It is the Crimea model,” the Washington Post quotes President of Kosovo Hashim Thaci as saying. The mention of Crimea is meant here to evoke the specter of the Maidan coup and the ensuing ugly civil war in Ukraine – events that prompted Crimea, with its ethnic Russian majority, to become a part of Russia again after 23 years of captivity in “independent” Ukraine. The US Embassy in Kosovo quickly defended Thaci’s position. “We want dialogue and cooperation, not a conflict in the center of Europe,” Serbian Prime Minister Aleksandar Vucic said in an interview to the Italian daily La Repubblica. Even the biographies of the antagonists speak for themselves. Hashim Thaci, an ethnic Albanian born in Kosovo in 1968, joined the armed guerrillas from the Kosovo Liberation Army (KLA) in his twenties. He was later accused of multiple war crimes in the bloody conflict that ended with NATO intervention and Kosovo’s separation from Yugoslavia (and Serbia) in 1999. All the other top leaders of Kosovo, after its unilaterally proclaimed independence in 2008, were also former KLA guerrillas – many with criminal records. Serbian Prime Minister Vucic, on the other hand, is frequently derided by the Western mainstream media as a former official of Yugoslavia’s Socialist party, once led by Slobodan Milosevic, a figure demonized and hated in the West. Vucic, however, was never involved in the atrocities that accompanied Yugoslavia’s collapse. Milosevic died under mysterious circumstances in prison in The Hague in 2006, following a five-year trial by the International Tribunal for Former Yugoslavia (ITFY), which never managed to prove his guilt in crimes against humanity. Despite these obvious facts and the Serbian government’s efforts to improve relations with Kosovo, Vucic, as well as Serbian Foreign Minister Ivica Dacic, continue to receive much worse press than Thaci in the West. Meanwhile, Dacic’s peace efforts culminated in the signing of the 2013 Brussels Agreement which normalized relations between Belgrade and Pristina. Despite this, Belgrade is routinely blamed by the EU and US for any crisis that springs up in Kosovo, especially in the northern part, largely populated by ethnic Serbs. The EU also looked the other way as Kosovo Albanian troops were dispatched to the Serb-populated northern areas of Kosovo following the recent train incident, going against the Brussels Agreement of 2013 – touted by the EU as a path to peace between Serbia and Kosovo. The preferred target of the mainstream media, however, is President Nikolic. He obviously struck a nerve with the mainstream media when he criticized the Balkan policies of outgoing US President Barack Obama, and expressed hope that with the incoming Trump administration, the US will change its policies which “have created much trouble” in the Balkans. Immediately, Nikolic was labeled “pro-Russian,”“nationalist,” and “dangerous” by some of the main news channels in the US and EU. 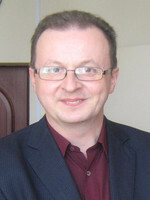 Pavel Kandel, head of Balkan studies at the Moscow-based Institute of Europe (Russian Academy of Sciences), believes that Nikolic's hope for a change in US policy direction is unfounded. Milorad Dodik, the president of Republika Srpska – a part of Bosnia populated mostly by Orthodox Serbs – was officially punished by the US State Department for sabotaging the peace agreements signed in Dayton in 1995, which left Bosnia divided. The Russian Foreign Ministry slammed the sanctions against Dodik in a special statement. 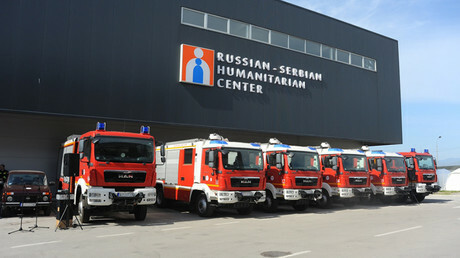 Sergei Lavrov also dismissed the EU’s demand to shut down the Russian humanitarian center in Nis. In his previous statements, Lavrov explained that the center in Nis was busy removing and deactivating bombs and other explosives left behind from NATO’s aggression against Yugoslavia in 1999. The bias of the West is there for everyone to see. Nevertheless, Lavrov keeps calling on Washington and Brussels to change their policies for the sake of establishing lasting peace in the Balkans – a task that can't be achieved without major players such as the US and EU.